America has always been a land of inventors: Whitney had his cotton gin, Edison his recorded sound, the Wright Brothers their airplane. My grandfather once invented a sound-cueing device for RKO Pictures and we kids in L.A. concocted our own skateboards. The Santa Fe Opera this summer considers the current era's most celebrated inventor in The (R)evolution of Steve Jobs. 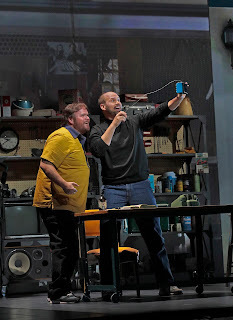 Composed by Mason Bates, with its libretto by Mark Campbell, the opera examines the life of the visionary Californian whose all-in-one smartphone is now a ubiquitous appendage in American pockets, that is when it's not occupying our hands and eyes. The story has Steve Jobs and best friend Steve Wozniak inventing the Macintosh desktop, but losing control of Apple in a management dispute. Burnt out but resilient, Jobs' eventual solo return to launch the first smartphone is one of the remarkable comebacks in the history of American business. Campbell’s treatment of the story, freely adapted and partly fictional, aims more for psychological insight than literal truth as it scrutinizes Jobs' visions and obsessions. The librettist's skillful assembly of the scenes enables a fluid telling of the tale with a cycling back arc and much rich detail to savor in between. Kevin Newbury's stage direction keeps his players moving in the fast-paced narrative, but gives them dramatic space to breathe and bliss in intimate scenes. 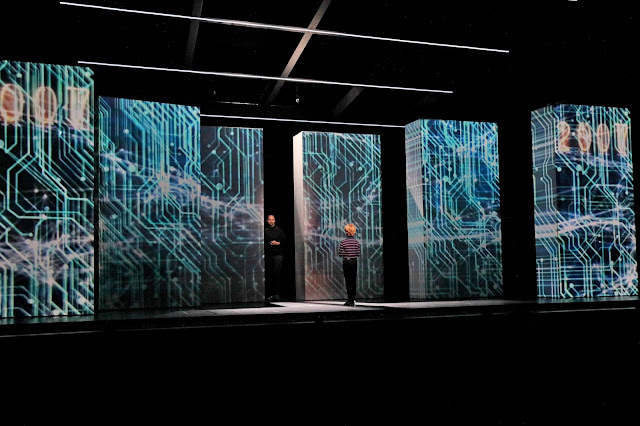 The numerous scene-changes call for a fluid stage solution, ably pulled off by Vita Tzykun’s designs, the 59 Productions company's evocative projections, and Japhy Weideman's clean and bracing lighting. Six huge rectangular boxes, wrapped in white mesh, are oriented vertically and animated from within with fluctuating imagery as they migrate to various locales on the Crosby Stage. Santa Fe Opera's lack of a stage curtain is turned to advantage; there is no break in the action. Locales shift between the hills of Cupertino and the mountains of Yosemite Park, from sylvan forests to sharp-edged corporate offices, from rooms in an ordinary suburban home to spiritual, almost insubstantial places of awe. Depictions of giant smartphone faces and networks of internal wiring alternate with an LSD trip in an apple orchard and Buddhist encounters. Paul Carey costumes his characters in fashions spanning changing times from the Fifties and Sixties to just a decade ago. The cast is embraced by Bates' monumental, kaleidoscopic, and continuously pulsing orchestra, its virtuoso performance under the direction of Michael Christie, with choral interludes prepared by Susanne Sheston. Throughout, the composer avoids formulaic meters that would make of solo vocals the kinds of rounded phrasings found in songs or arias. Also avoided are hummable tunes. Favored are fast-paced declamations in the manner of Wagnerian opera and especially in the tense utterances associated with Jobs' professional struggles. Yet lyrical flights grace scenes of love and family interaction, particularly those with Jobs and his wife, Laurene. 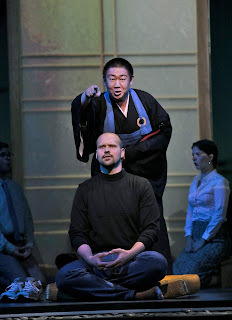 A tender opening scene has Jobs’ father, Paul (Kelly Markgraf, in his SFO debut) presenting his young son (the non-singing Jonah Sorenson) with a workbench. With the next scene and thereafter, the adult Jobs (baritone Edward Parks, bearing a good resemblance to him), takes his persona through a tour-de-force emotional journey from early promise to middle-life betrayals and cruelties, and finally to the emotional acceptance of his own death. On stage most of the time, Parks did not so much dominate as lead the ensemble. His stage bearing took on the self-contained, almost inscrutable manner of Jobs himself, far from an operatic stereotype. In recurring scenes, Buddhist Kōbun Chino Otogawa (plangent bass Wei Wu), is never far away as spiritual guide, popping up from this dimension or the beyond at just the right moment. He's always ready with pithy, irreverent jokes and admonitions to puncture Jobs' self-centeredness and re-orient his soul. As much for comic relief as zen philosophy, Kōbun's return is always welcome. Tenor Garrett Sorenson’s wonky Steve Wozniak (Woz), Jobs' best friend, provides his strongest dramatic counterweight. Their brotherly love as early co-creators devolves later into antagonism, as a company in crisis copes with its ever more imperious and impossible boss. The confrontation inspires Bates to his most agitated music and becomes the emotional climax at mid-point in the drama. The other tense relationship is with early love-interest Chrisann Brennon (Jessica E. Jones, excelling in an unsympathetic role), whose flower-child importuning leads an innocent Jobs to his first psychedelic high, but whose clingy character later wears thin. Their love-child, Lisa (an offstage character), becomes the source of further tension as Jobs initially denies his patrimony and support, but later in life relents and adopts her. As Jobs’ wife Laurene, warm and generous mezzo-soprano Sasha Cooke becomes an ever more present and important part of the story and a steadying influence on his demons. Her confrontation with Jobs in a late scene is the breakthrough he needs to face and accept his mortality. Following that, in a flashback to their wedding, Kōbun utters a prequel benediction for Jobs' ultimate serenity. Laurene has the last words in the opera and its most lyrical utterance when she admonishes the audience to step back from that little device and be aware of life and each other. For all the action on stage, it is Bates’ propulsive orchestral score that is the main protagonist. Lushly cinematic, accessible, essentially tonal but with frizzing dissonances, its elements weave in and out with original sounds for any emotional effect. The orchestra’s electronic element (performed by Bates in the pit) integrates seamlessly with the acoustical instruments around it. The score substantially expands the palate of the orchestra, especially in bass regions when in moments of existential threat. Its explosion of new colors prompts comparison with the sorts of innovations Hector Berlioz came up with in the nineteenth century. The outburst of sustained applause at the end of the work’s premiere on July 22 was spontaneous and genuine. 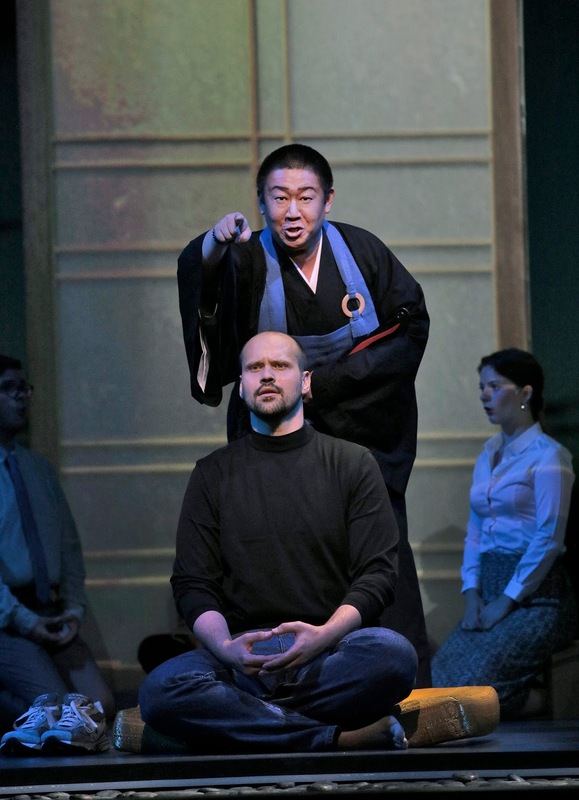 I hesitate to use the term "crossover" when referring to this opera's musical style, but its sound-world should also appeal to audiences not accustomed to opera. 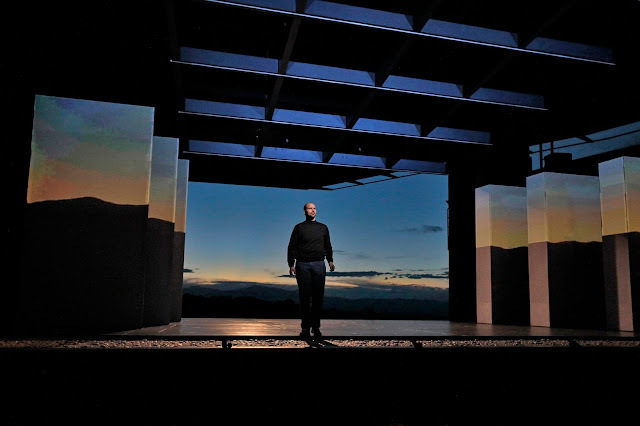 As the latest premiere in the venerable Santa Fe Opera’s nearly annual introduction of a new work, this one should have legs. It is already scheduled for performances in co-producing companies at San Francisco and Seattle. With ticket demand strong here, General Director Charles MacKay just added an additional Santa Fe performance for August 22. 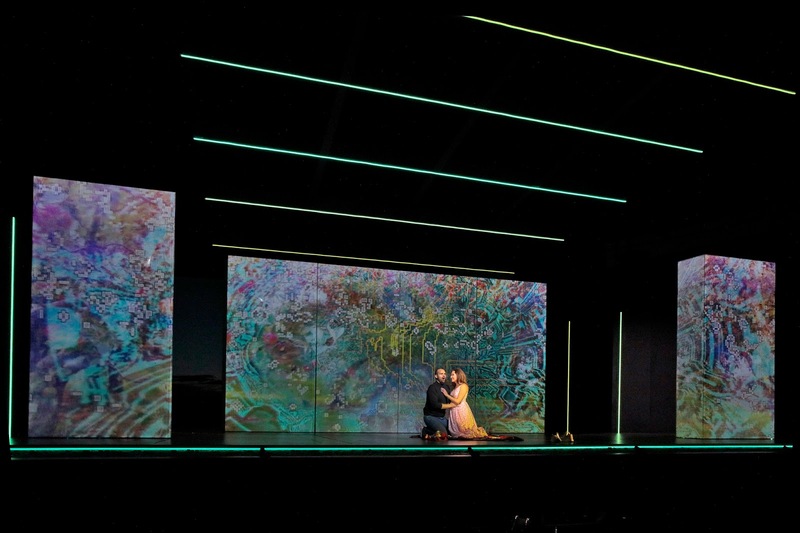 A protagonist that looms large in this opera but was not onstage is California itself. With its heterogeneous population coming from all around the world, its inhabitants tend to think outside of conventional boundaries to find solutions for big challenges. The California ethos is to be curious, inclusive, interactive and adaptive, a societal model analogous to the smartphone's simple-to-navigate complexity. Contrast that ethos, available to all in this nation, with siren calls heard in some quarters for a monocultural society that loathes the present and fears the future, that follows a trumpeting chimera for self-contained purity to the exclusion of outside influences. Steve Jobs, whose natural father was a Syrian citizen, was raised by loving adoptive parents in a working class community in the Bay Area of California. A brilliant visionary, his invention, the smartphone, made the old phone great again. Performances reviewed: July 22, 26. NOTE: After this review was posted, the SFO informed that the actor playing young Steve Jobs, originally announced as Asher Corbin, was in fact Jonah Sorenson. The correction is posted above.